Grab attention for your product or service and draw in business with our online poster printing services. With three different sizes to choose from and printed on Aqueous coated 100 lb. Gloss Book, our posters are perfect for spreading the word about promotional deals, sales and special events. 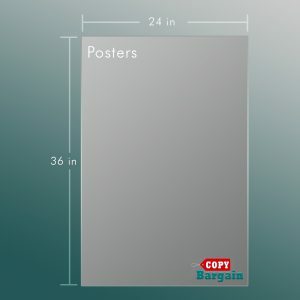 Our posters come in 12″x 18″, 18″x 24″, and 24″x 36″ giving you the option of choosing the perfect size to promote your message as well as the space necessary to clearly get your point across. 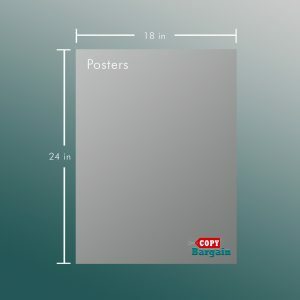 If you are looking for professionally printed posters that will capture the attention of customers or potential clients, consider Copy Bargain’s online printing service. Our industry-leading print products and design services enable you to create the perfect poster for your needs with just a few clicks of your mouse. In our digital environment, it can be easy to forget how much of a draw paper advertising products can still be. However, one look at the sidelines during a football game or the walls of a subway train car will tell you how important traditional advertising avenues remain. By ordering online, you’ll be ready for every promotional, sales, marketing, networking or casual event that comes your way. Don’t go unheard. Our poster printing service ensures that your message is always received loud and clear. Your business is important, and you also understand the importance of working with companies that can be trusted to get the job done right. Since 2013, Copy Bargain has worked with large and small businesses across a wide range of industries to provide superior printing services with lightning-fast turnaround times. There are certain attributes that make a business great to work with. Customer service, individualized printing services, fair prices and quality products all come together to provide not only a great poster but also a great experience. Our marketing experts are available to discuss which poster and design will work best for your situation. 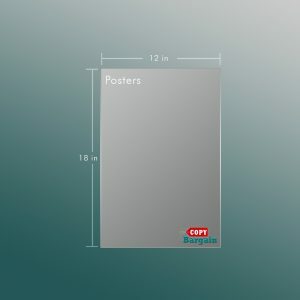 With logo designs, print patterns and other features to make your poster really pop, we offer you all the tools you’ll need for professional poster design.